Each boat numbering kit contains: two sets of numbers (1 set for each side of your boat), squeegee (required for proper installation), and application instructions. 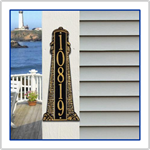 Boat Registration Numbers are 3" tall and approximately 22" to 26" long (length depends on font selected). Recommended Font (type style) is Arial. Other fonts are usually acceptable if they are clearly visible. Check with your individual state for boat registration number requirements. Note: Only add the Quantity of 1 to your basket for a complete set.